What is the Legendary Street Team? 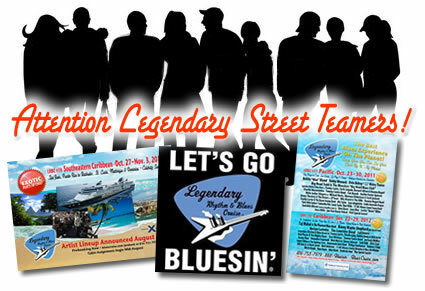 If you’re passionate Legendary Rhythm & Blues Cruise and want to share the love, you’ve come to the right place. Below is a quick overview on how the Cruiser Street Team works, Signing On instructions, and some answers to common questions. Do I need to have promotions experience to join? You do not need prior experience to join our team. We realize your participation is a good-will gesture, and appreciate what you can bring to the table. However, referral fees can only be paid to those who have previously sailed with Legendary and are sailing within 10 months of their “virgin” referrals. Street Team members share their enthusiasm through a number of activities with the goal of bringing virgins on-board to share their Legendary experience with! This is the thing. You already go to shows, you attend festivals, you taunt your friends with Blues Cruise memories… so why not convince them to join in the party and let us reward you to do it! 1. Carry promotional material on you and make sure to have your name on it so that your virgins can let us know who sent them. 2. Come see us at festivals! You can follow the land yacht here. People will notice how much fun you’re having and ask YOU what all the hype is about. That makes your job easy! 3. Wear your Legendary Gear when you go to shows and just out and about. 4. Hang out and share your cruise stories with friends. Showing the DVD is a great way to put people over the edge. 5. Distribute referral cards. The only way to track your leads is to know who sent them. 6. Carry your Legendary flag to festivals and shows. Especially the festivals that we can’t attend! 7. Flyer area clubs and record stores. Signing up simply registers your interest in helping to promote the Blues Cruise. We would love to have as many photos submitted as you can to show participation and promote on our website! The specifics of what you do depend on how much time you have, and how much you want to do. What sets the Street Team apart from everyone else? As a street team member, you’ll be entitled to even more rewards. By joining the street team we understand that you are passionate about sharing your experience. So here’s the scoop! We want to reward our Veterans who bring their Virgin Friends to the Legendary Rhythm & Blues Cruise with a $50 Referral Fee per person. You must sail within 10 months of the cruise (before, on, or after) your Virgin sails. They MUST give us your name at the time of booking – this is very important! Once you convince 5 of your virgin buddies to join you on your voyage, we’ll not only give you $50 per virgin, we’ll hook you up with an extra $50 gift card that you can use on-board in the Bluesin’ Bazaar or toward your pre-book for a future cruise. What is a Legendary Virgin? This is someone who has never sailed on the Blues Cruise. VERY IMPORTANT: To receive your Referral reward, your Virgin must give your name at the time of booking, pay in full and sail.